Summary: If you are planning on moving, renovating, or simply downsizing, you will need a plan of attack for how to get rid of old furniture. Here are some tips that may help you out. If you find yourself in a position where you need to get rid of furniture in your house, there are numerous routes you can take to take care of the job. Due to the potentially toxic substances in stains, coatings, and foams that come in most furniture, furniture usually cannot be recycled. 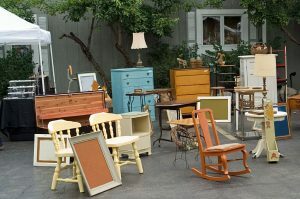 You can, however, sell, dispose of, or donate the furniture you no longer need. If you are looking to minimize the amount of financial loss that comes from parting ways with your furniture, your best bet is to simply sell it. There are plenty of ways to advertise the furniture. Flyers around your neighborhood, posting on Facebook, or making an ad on Craigslist are all effective ways of getting the word out there. Hopefully you can break even but any amount you walk away with can help you with any furniture you will buy in the future. When negotiating with strangers, take precautions to make sure you are not getting scammed and meet up in a public area, if possible. If you are just trying to get rid of the furniture, be it a couch or bed frame, there are multiple options to choose from. If you are working with smaller pieces of furniture, you can call your local waste management company to see if they can accommodate the furniture on your city’s scheduled trash day. If so, you can likely leave the furniture on the curb for the workers to pick up and dispose of for you. If you are planning on moving and plan on getting rid of multiple small items at once, you can rent a dumpster bin. These bins are oftentimes quite large and can hold the other trash you may be tossing away during the moving process. If your furniture is good condition, has never been infected, and does not need to be repaired, you can likely donate it. You can get in touch with Goodwill, Salvation Army, local shelters, and other similar places to schedule pickup or drop off times so you can give your furniture to someone in need. Blog submitted by Wicker Paradise: Looking to upgrade your patio? Shop for patio furniture cushions and other pieces at Wicker Paradise today!